Spending last week co-leading Don Smith’s Bryce/Zion workshop, I got a taste of my own medicine: the first opportunity to photograph something I’ve long wanted to photograph (usually I’m the one showing others something for the first time). In this case it was Zion’s (aptly named) Narrows, a deep gouge carved in red sandstone by millions of years of Virgin River flow and flood. So vertical and narrow is the canyon that most of the route is wall-to-wall river that requires spending about eighty percent of your time walking through the river rather than beside it. Unfortunately, this hardship appears to be no deterrent to swarms of hikers of all ages, shapes, and fitness levels. I’ve wanted to photograph the Narrows for a long time, but didn’t think this would be the year because Don and I usually head home immediately after a fall workshop (to allow time to recover before the next workshop—starting Thursday we’ll be in Yosemite for my Yosemite Autumn Moon workshop). But when several of our long-time workshop participants (now as much friends as customers) invited Don and me to join them on their post-workshop hike up the Narrows, we couldn’t resist. So, when the workshop ended mid-morning Friday, seven of us donned our rented “waterproof” (ish) socks, shoes, and pants and headed upstream from the Temple of Sinawava. 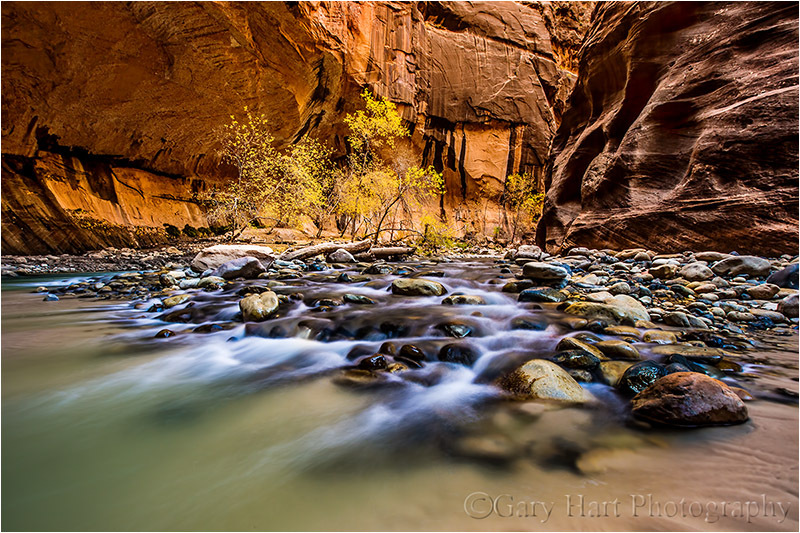 I’d been to Zion a few years ago, but on that visit only walked up as far as the entrance to the Narrows before time and equipment limitations (I wasn’t dressed for hiking through cold, hip-deep water) forced me to turn back. While the paved, one-mile trail to the start of the Narrows is quite beautiful as well, I was able to resist the temptation to pull out my camera. But from the instant I put my feet in the water and started upstream at trail’s end, I found myself overwhelmed both by nature’s ability to amaze, and its power to impose its will. Taking in the magnificence of time’s handiwork, I was also reminded of nature’s ability to do pretty much whatever it wants—it took about a half hour to adjust to the river’s inexorable push and overcome the feeling that the next step would be the one that would douse me from head to toe. But adjust I did, eventually reaching the point where the relatively short detours onto dry land felt unnatural. We stayed more or less together for a short distance before separating to appreciate and photograph this wonder at a more personal pace. With frequent stops to photograph and gape, plus a short detour into a side canyon, I made it partway through Wall Street, a stretch of canyon where the walls squeeze the river like towering high-rises, before turning around. About a mile downstream from Wall Street, the river bends abruptly and the canyon widens enough to allow a few deciduous trees to take root. After working this scene from across the river for a few minutes, it became pretty clear that the shots I most wanted would require getting as close as possible to the rapids slithering through a bed of river-rounded rocks that are no doubt completely submerged in spring. Camera and tripod raised high, I forded at a shallower place just downstream and slowly navigated into a deeper channel in front of the rocks, eventually finding myself hip deep on a sloping, sandy bank. Perfect. I set up my tripod and commenced composing, until a vague sense of disorientation alerted me to the fact that I was sinking like Tarzan in quicksand. Yikes. While I didn’t need to worry about a crocodiles and blow-gun wielding natives, the rapid current and unstable riverbed made keeping my tripod steady quite difficult. I found that it was possible to plant the tripod securely enough, but after each exposure I needed to reposition myself or risk sliding into the chest-deep water behind me (which wouldn’t have swept me to my death, but it would certainly have gotten me and my gear far wetter than I preferred). Stage two of our adventure was to take place the next day, when Don, Don’s wife Beri (who’d flown out to join our hikes following the workshop), and me were to join some of the Narrows’ group on their hike to the Subway. Zion limits the Subway hike to eighty hikers per day, but we navigated the permit process without complication. Or so we thought. Arriving, permits in hand, at the trailhead in the pre-sunrise darkness, we found a ranger waiting to accuse Don of running a commercial venture in a restricted area. No amount of reasoning could get him to comprehend that this hike was not part of Don’s workshop (Don recently had knee replacement surgery and wasn’t even sure how far he’d be able to go), that absolutely no money (or other financial considerations) was involved (an e-mail from Don making that clear didn’t sway him), that we were actually just tagging along on the other guys’ hike, and that we were all planning to go at our own pace (in addition to Don’s recent surgery, we represented a pretty wide age and fitness range). Since we truly were doing nothing wrong, Don could have made things difficult and insisted on his right to continue, but taking the high road, he and Beri simply opted out. And despite the fact that I’m a pro photographer who guides my own workshops, for some reason the ranger would have allowed me to go, but I chose to stick with Don and Beri. While I’m all for stronger enforcement of the National Parks permit process (something we seriously need given some of the behavior I’ve observed), I found this particular action a little overzealous. While I completely understand why the ranger had questions, and his right to ask them, this kind of blind enforcement of the good guys who follow the rules risks a National Park system with photo workshops guided only by rule breakers who know how to fly under the radar. Nevertheless, in this case I’ll give the ranger a pass because he was quite young and clearly lacked the either experience (or wisdom) to recognize that we weren’t breaking any rules, or the authority to use his better judgment. And as it turns out, we three outlaws ended up having a very nice (albeit more leisurely) day that included a far less strenuous hike up to the Emerald Pools. Wow!!! Sounds like a very interesting journey. The image speaks for itself. Too bad you were unable to make the trip to the subway. Perhaps next time. Thanks for sharing the information. I had two turn around experiences at the Narrows and the Subway. At the Narrows it was rainy and they said we had to turn around if it started raining heavily due to flash flood danger. So i got a ways up and a few images and then it rained. In the Subway I was foolishly alone and half way there when I jumped across the creek and twisted my knee. I decided not to go on and was in a lot of pain by the time I made it back up to the parking lot. It sounds like you made a wise decision, John. The Subway hike is pretty grueling even on two good legs. Outstanding Image. Thank you so much for sharing with us. It’s my pleasure, Linda. Thank you. A great adventure, and a level-headed attitude toward the frustration of a zealous young ranger. Congrats on both accounts. And the photo… stunning. Gary, we had a similar problem with a ranger in Death Valley on a photo workshop this year. Different because the permit had been delayed by the government closure, but the ranger was equally obnoxious. This guy actually treated us respectfully, he just exercised poor judgement.